This web site features short descriptions of and links to a few of my long journeys. The journeys are grouped under a few broad categories. Click on a category to see further details or scroll down to view all the journeys. The last journey was undertaken in 2012 and no new journeys are planned. In March 2007, my wife and I set out to climb the many sand dunes of California. The coastal dunes did not pose a problem but the desert dunes were a different story. The weather did not cooperate and neither did our car. Here is our adventure on foot and in car. On August 1, 2005, I began my solo, 110-mile walk around the Salton Sea to find out the effect of the combination of high temperature and high humidity on my remaining brain cells. I may have lost a few, but apparently I still have enough left to write this account. On July 31, 2003, Ron Perkins and I set out from Badwater in Death Valley (elevation 282 feet below sea level) to walk all the way to the top of Mt. Whitney (elevation 14,497 feet above sea level), approximately 150 miles away. Did we make it? You will just have to read my report. In 1998, my wife Joy and I, along with a few other friends, walked the entire length of Death Valley National Park. We walked 180 miles in the daytime in July. Death Valley is generally considered to be the hottest place on earth. We wanted to prove to ourselves and the world that, with proper preparation, it is possible to accomplish seemingly impossible things. The year 2012 was our inspiration for undertaking to hike at least 20 miles on each of our 12 hikes. But, like alcoholics, we couldn't stop after finishing the 12 hikes. Curious? You just have to read my account. In September 2010, Joy and I resolved to climb one peak a week for the next fifty weeks. It was to celebrate my fifty years in the U.S. Besides my usual rant about the peaks climbed, the narrative weaves in a condensed memoir of my years in the U.S. In May 2010, Joy and I began our quest to hike all the trails of Mt. Diablo State Park. The 20,000 acre urban park has close to 200 miles of trails. However, our bigger worry was the likelihood of warm temperatures and the problems associated with it. Read this account to find out if we achieved our goal. The Real "Bay to Breakers"
In April 2009, six of us set out to hike, in two days, from the Bay near Palo Alto to the Pacific Ocean. Our route's distance was 46 miles with an elevation gain/loss of 7,000 feet. Some of us did accomplish our goal, but only after surmounting a major obstacle. A short account of two other mini-adventures is included too. On May 1, 2008, Joy and I, along with our friend Patrick, set out to hike 26 parks in the San Francisco Bay Area. The 26 parks had their names begin with the 26 letters of the alphabet. Our goal was to hike 14 miles each day and complete our hike-a thon on May 26. On March 19, 2006, my wife and I began our quest to hike the 350 miles of trails of Henry W. Coe State Park. We were told that the goal was too ambitious. We knew that the park's large size and rugged terrain would present problems. Read this account of our trials and tribulations and find out if we achieved our goal. In 2004, I stayed close to home and hiked to the top of nearby Black Mountain via eight different routes. Big deal, you may say, but wait till you read how World War II, geocaching and the Caspian Sea fit into my hiking adventure. In April 2002, my wife Joy and I and a group of our friends began our triple nine mountain madness. Our goal was to climb nine Bay Area mountain peaks in nine consecutive days and in the process, climb at least nine thousand meters and thus exceed the height of Mt. Everest, 29,029 feet. You may also wish to read this San Francisco Chronicle article about it. 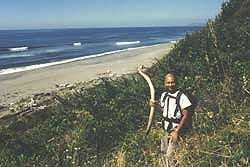 On May 15, 1999, my friend Bob Cowell and I began our walk along the entire planned 400 plus miles Bay Area Ridge Trail. The purpose of the hike was to raise awareness of the need to complete the Trail and raise funds for the Ridge Trail Council. While most of the hike was on solid ground, we did kayak the mile wide and very choppy Carquinez Strait. This web site features a full account of the hike along with pictures. On June 15, 1985, Joy and I began our quest to walk every street in our town. We walked a few miles whenever we could and achieved our goal in six months. Read a story about it in a Peninsula Times Tribune article. In November 2000, I kayaked the entire shoreline of the Salton Sea, the largest lake in California. This web site features my trip report, pictures and observations of my wife, Joy. In July 1996, Joy, Bob and I joined a group sponsored by an organization called Coastwalk and walked the coast from San Francisco to the California-Mexico border. An article in the Los Altos Town Crier covers this walk. In September 1995, Bob Cowell and I walked 475 miles along the coast from the California-Oregon border to San Francisco. Read a San Francisco Examiner article about it. In June 2001, I traveled to Cherrapunjee, India. Read my account of how I was left high and dry there during its rainiest month. Then, you may want to read this short article in the San Jose Mercury News about the Indian monsoon. In June 1988, Joy, three friends of ours and I walked across England carrying 25 lb. backpacks. An article in the Loma Prietan describes this walk.